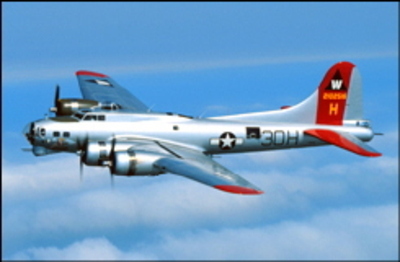 If you’re a fan of the “Flying Fortress” – the B-17 – and you couldn’t make it to OSH this year, no worries. The Aluminum Overcast is on tour, and will be in the NY area August 16-18! Rides aren’t cheap, but they’re not that bad either, when you consider how many opportunities you’ll get to ride in a B-17. More information, and a schedule, is available on the EAA’s B-17 site. Happy flying! I was 15 years old the first time I saw her, and I fell in love straight away. I was mesmerized...I couldn't take my eyes off of her. Sure, she had a weird-looking nose, but that only made her more mysterious in my eyes. She didn't simply do the job, like all the other ones. She soared. She didn't lift off, she leaped into the air. She made a different kind of noise than all the others. That noise, for the past 26 years, has made me stop what I was doing and look to the sky, with a huge smile on my face. Today I saw her for the last time. This was not just another airplane. She made the Earth move; she woke you up whether you wanted to be awake or not. On very overcast days, it felt like she was coming in for tea. The house rattled, my brain along with it, and I loved every minute of it. Newcomers to the neighborhood always reacted as if we were being invaded. They would duck in terror, looking up and waiting for the bombs to hit. I once saw a neighbor, who served during World War II, literally hit the deck. When the Concorde first started flying, I was constantly preoccupied with her. True story: being raised Catholic means that one blesses oneself when passing in front of a Church. I was in the car with my parents one day, that first year or so that she was in service, and we passed a Church. I was engrossed in a book, so my Mom called my attention to where we were, and I absent-mindedly crossed myself and went back to the book. A minute or so later, Concorde was approaching, and I guess I hadn't picked my head up yet. My mother called my attention to the airplane, and this time there was nothing absent-minded about the way I crossed myself. I was downright reverent. My eyes widened in horror instantly, as my mother's eyes narrowed into murderous slits. Supreme sacrilege! I sat in the back of that car waiting to die. A moment passed and I (clearly approaching a career in PR) said something about how we bless ourselves to give God both our thanks and his due, and that I blessed myself because I wanted to thank God for that airplane. My mother's eyes were still slits, but she said, "You know, coming from anyone else, I'd never buy that, but I believe you." And I wasn't lying, either. I did, and do, feel reverent about that plane. A couple of days ago, I mentioned Concorde's last flight to a someone, and she said, "Oh, is that a big deal?" I had to laugh. A big deal? It kind of brought me back down to Earth, you should pardon the pun. We all find our passions in different places; is it silly to love an airplane? Maybe. Color me silly. I've been dreading this day for six months. My friend Dan and I both knew exactly where we'd be today; saying farewell to a good friend. I suppose in the overall scheme of things, it's not a big deal. But today I am sad, and Dan is sad, and I know a lot of other people are sad too. Concorde, you see, was extraordinary. Like deciding to go to the moon, and actually getting there. It was an everyday reminder of our capabilities. I've become very enamored of a TV show called "The West Wing" -- the writing knocks me out. A recent rerun discussed the importance of trying to reach beyond our limits; the importance of raising your hand and going to the blackboard, as it were. The Concorde is what happens when we raise our hands and go to the blackboard. CNN's Richard Quest, a passenger on today's flight, said: "This is the first time in history that aviation history is taking a step backwards. Everyone on today's flight is well aware of that fact." Will we ever see another supersonic passenger jet in our lifetimes? I think not. and that's a shame. Because we all need daily reminders of the accessibility of the impossible. We need it so that we can find solutions and find ways to make peace with each other, and find ways to make peace with ourselves. So, Dan and I, along with his girlfriend Gloria, left at the crack of dawn this morning. We drove to a spot just beyond the runways of JFK, and Dan turned on his scanner, and we waited. It was COLD out! Just before her scheduled departure, one of the controllers, a fellow named Sam Kohn, (and these folks simply DON'T "chat") came on the frequency and addressed her crew, and said, "I was lucky enough to be in this tower when the very first Concorde arrived in 1977 -- I gave her clearance to land." He mentioned how it had been a pleasure working with the plane, and its crews, over the years. Then Sam paused and said; "We're sure gonna miss her." (You could just about hear every crew member on the plane and in the tower choke up at that point.) A couple of minutes later, we heard the words we'd been waiting in the dawn to hear; "Speedbird 2, you're cleared for takeoff." We got out of the car then, and stood and looked at the sun, at the spot in the sky where we knew she'd be when she took off. We shivered, and chatted, and commented on the other people who'd been waiting in the parking lot as well. When we saw her, though -- when she climbed out of JFK for the last time -- there wasn't a sound from us. She roared up and banked left and headed for home. We stood and watched until she was a speck in the sky. Then we got back in the car and went on with our day, with a little less magic in our lives. Hell, yes! I wanted to say, earlier this week -- it's a big deal! It was among my daily miracles. She's off to airplane heaven now, where the skies are always blue and the tailwinds are always strong. I will miss her terribly; there will be a hole in my heart and a hole in the southeastern sky above Brooklyn. Fare thee well, Connie. We're sure gonna miss you.